You are here: Home / Personal development / Can Success be archived by following a formula? It is not good enough to set your goal at being rich. You need to make a concrete contract with yourself. This could be, I will make $500,000 by next year (concrete date as well). You are thus setting your goal and at the same time making a contract with yourself. It is inevitable that in your journey to success you will find some road works that will delay you, test you, and annoy you. You must understand that sometimes obstacles are there to test your resolve. They are not there to stop you but to make you realise whether or not you are really going down the right path. You actually have to picture your success and goals. You can see yourself spending that $500,000. Do not just think about it but imagine it, touch it, feel it. Doesn’t matter how successful or prepared you are, self doubts will always come into the equation. They are as inevitable as obstacles are. Convince yourself that you are able to overcome any doubt on your ability, time or success. To be successful you must do things to the best of your ability. There are no half measures. Having to give 110% to your project is not a cliché it is really necessary. Separate your plans in easy achievable steps. Write concrete dates where each step should be finished and stick to your plan. Think about how you felt when you achieved something, however small in your life and that should be your focus when things are not going as planned. It is all in the mind, whatever you want to be, you can be! 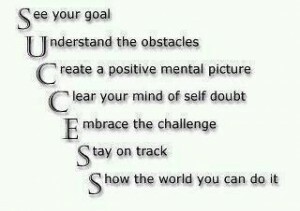 Follow these simple steps and you will succeed at whatever your measure of success is !